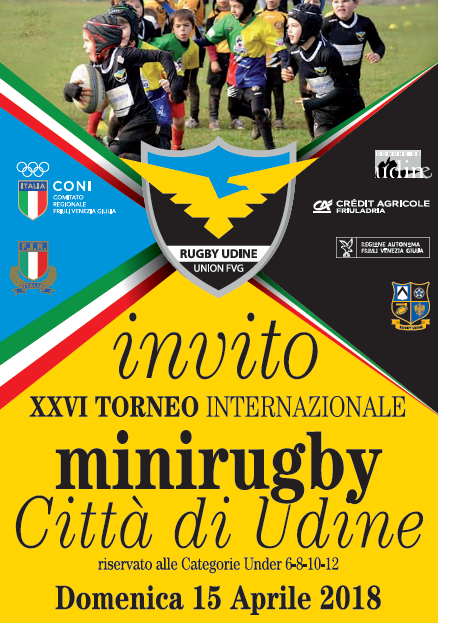 TheStade Rugby U12 go to Udine !!! On the 15th of April our U12 squad made by 15 valorous and proud players went to skirmish at the 26th Udine tournament. We arrived the day before and after a short nite the squad was on the pitch at 8:00 sharp ! We had 8 games of a high intensity against one of the bests teams in Italy. We had the occasion also to meet the Italian National Coach who did the visit to the tournament ( a sign of the importance of this tournament)! We are very proud of all our mates which were fighting with a Spartan spririt !!! Our kids progressed very well during the tournament and found solutions in front of real challenges. They were very valorous. Despite the results which does not reflect the efforts we were really good and many teams came to congratulate us! A very good achievement! The objective was to get the kids acquainted to such a Rythm and real rugby level in the light of progress and pave the way to Treviso tournament. Here with Conor o Shea DTN Italian National Technical Director. Proud of you guys and our u12 power girl !